Protecting workers takes more than just keeping them from falling, their equipment also needs to be kept safe at height. Struck-by falling objects is a leading cause of injury for workers and the 3rd highest cause of death in the workplace. Our Fall Protection for Tools products make work environments safer and more productive by drastically reducing incidents resulting in personal injury, equipment damage, and tool loss. The most comfortable, lightest-wearing, truly innovative safety harness ever created. ExoFit STRATA™ features our exclusive LIFTech™ load distribution system, it takes the weight off your shoulders and redistributes it down to your hips. Additionally, PolarMesh™ padding delivers advanced breathability, and the EZ-Link™ quick SRL adapter simplifies connecting and disconnecting your personal SRL like Nano-Lok™. If your safety harness is weighing you down, Lighten Up with the ExoFit Strata™. You live on the edge. We'll keep you safe! 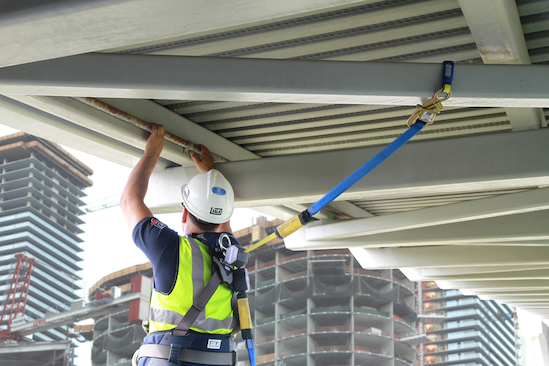 3M™ DBI-SALA® has revolutionized the Fall Protection industry again with the Nano-Lok™ edge Self Retracting Lifeline! It's specifically designed for foot level tie-off and sharp leading edge applications. This ground-breaking new product includes an 8 ft. (2.4 m) working length, is ergonomically designed for comfort, and is available in single and 100% tie-off configurations. Today's generation of harnesses address all the key needs of the worker: comfort, ease of use, and durability. Features such as locking quick-connect buckles and innovative torso adjusters help eliminate the need to make adjustments during the day. State of the-art breathable mesh padding and lightweight aluminum components ensure worker comfort. Strategic use of fabrics and plastics in wear areas, plus moisture- and abrasion-resistant webbing help to increase the life of the harness and the overall satisfaction of the user. Click here for more.